If daddy loves to spend time in the kitchen, then this is just the perfect gift for him this Father’s Day! 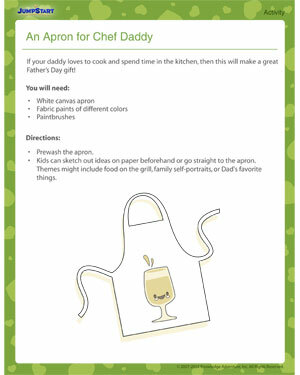 Make him an apron that’s easy to create and great as a gift! Once dad gets into the apron, you can try making some delicious creamy baked potatoes with sour cream and broccoli with him in the kitchen and give mommy a break! You’ll remember this easy-to-make simple recipe for a long time! Browse more holiday activities online.